I love my dog. I love knitting. I love yarn. I love photography. You would think that it would be simple to find great patterns that combine all of these things–until you decide to knit a dog sweater for your beloved prince and you scroll through Ravelry hopelessly for hours on end, sorting through some very questionable stuff (like dinosaur and bunny suits fitted for a dog). There’s a big opportunity here for some trendy, well made, and professionally photographed dog sweaters! Do you hear my desperate cries, designers?! Luckily, I’ve sorted through the good, the bad, and the ugly so you don’t have to–here are a few patterns for your spoiled pups that are practical and trendy. This is THE ultimate dog sweater pattern available. Go ahead and fork over the $9, you won’t regret it. Well written (of course, it’s a Blue Sky pattern!) and fun to knit, this is the one sweater pattern I have knit for Homer, my 45 lb. pit mix pupper. I couldn’t recommend this pattern more. This little number is knit in the round and includes some measurements to check before buying the pattern. 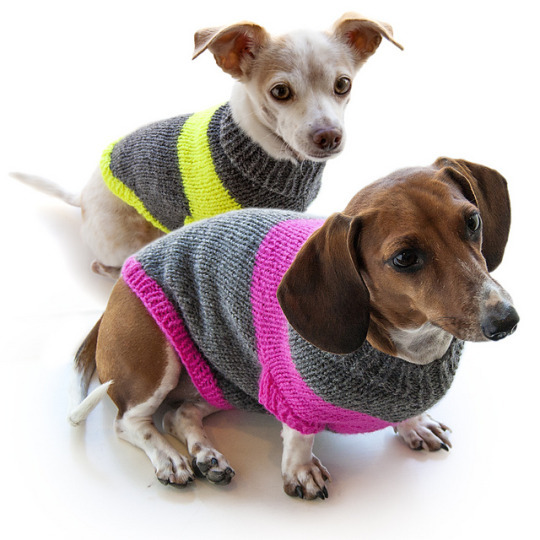 I vote yes on the neon stripe, too–just another way to personalize for your pup. 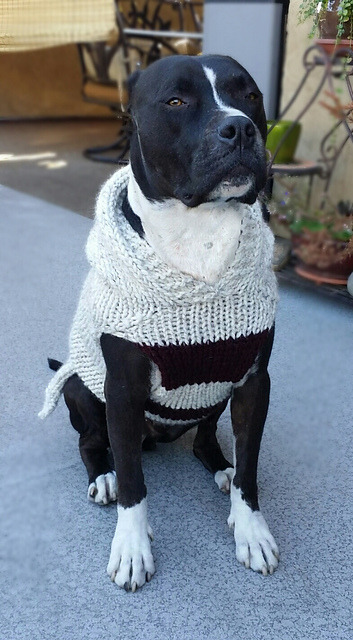 After searching far and wide, I think this is my next sweater pattern to knit for my pup. One of the few pitbull friendly patterns for those often wide, deep chests and big block heads. 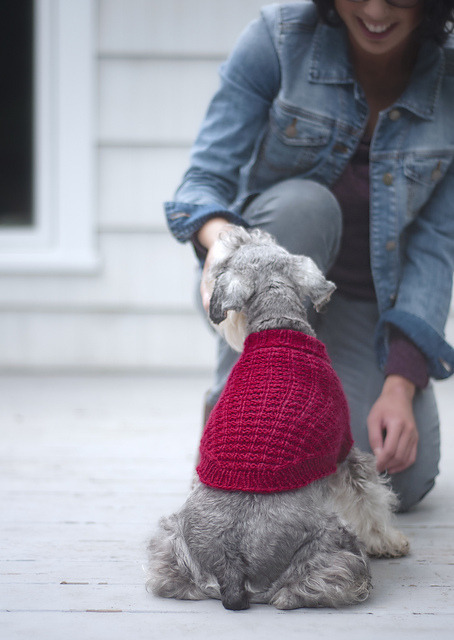 I would knit this in my favorite superwash Merino–after all, dogs can have sensitive skin, too! For the little pups, there are abundant options! 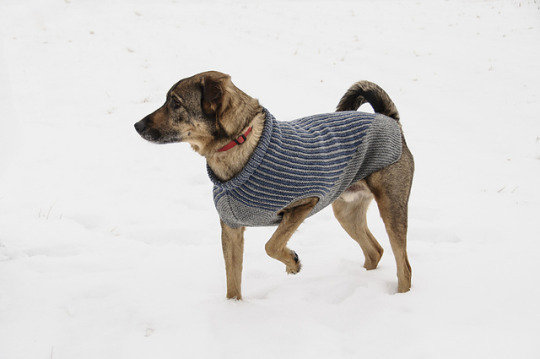 This handsome Westerloe dog sweater from Kirsten Kapur has to be top of the list for anyone with a small dog. It’s part of a book called Drop Dead Easy Knits that includes lots of beautiful patterns. This adorable sweater does good deeds: 100% of the proceeds go to the Michigan Area Animal League. 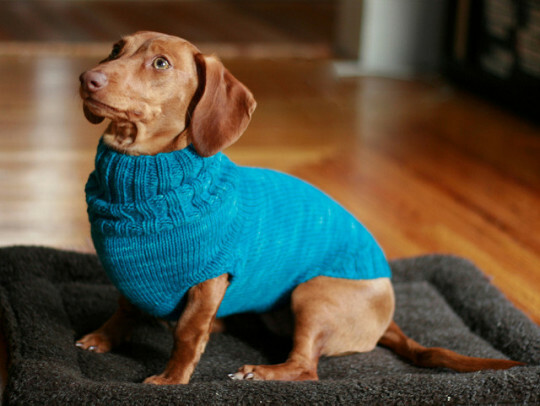 If you have a longer dog or dog blended with dachshund, it can be very hard to find a sweater to fit–Pam has offered this pattern up as the perfect solution (on adorable dog model, Crush)!